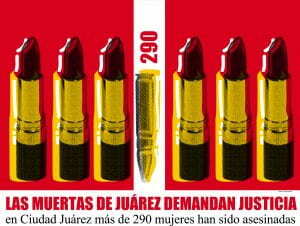 The murdered women of Juarez demand justice. 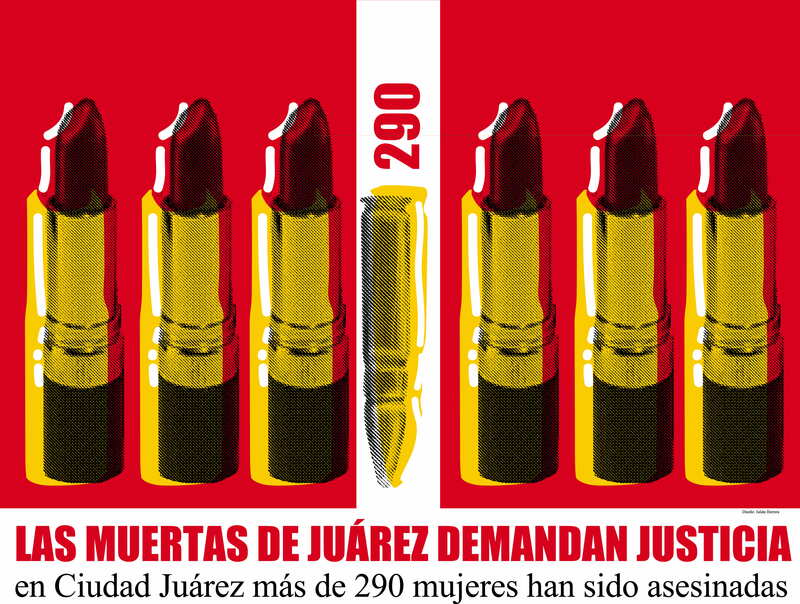 More than 290 women have been murdered in Ciudad Juárez. Political movements are strongly remembered through the iconic visuals created amidst the controversy. Collecting these artistic interpretations is the mission of the Center for the Study of Political Graphics (CSPG), a Los Angeles-based nonprofit that gathers, preserves and showcases international poster art that responds to the cry for social change. Eighteen of these posters have been selected for exhibition at the USC Fisher Museum of Art in partnership with the USC Shoah Foundation: The Institute for Visual History and Education. The exhibition, titled Denouncing Violence Against Women, showcases political posters that are divided into four sections denoting forms of violence towards women: Dehumanization, Individuality, Trauma and Breaking Bonds. This exhibition is presented as part of USC’s Genocide Awareness Week, and the posters on display at the USC Fisher Museum of Art explore the artistic response to international genocides in Armenia, Congo, Guatemala and Rwanda, as well as the Holocaust and the murders of women in Ciudad Juarez in Mexico. It also presents visual cries against domestic violence, torture and trafficking. Denouncing Violence Against Women reveals the power of art and creativity to confront social injustices. In the 1993 United Nations Declaration of the Elimination of Violence Against Women, the matter is said to be a “manifestation of historically unequal power relations between men and women” that have long prevented the “full advancement of women.” The posters on display represent a refusal to stay silent about these issues and empower those whose voices have long been quieted. Denouncing Violence Against Women was curated by USC students Michelle Crisosto, Lauren Dodds, Helena Liikanen-Ranger and Amber Spinelli, as part of an art history class conducted by Dr. Selma Holo, associate professor of art history and Director of the USC Fisher Museum of Art and Dr. Dan Leshem and Dr. Stephen Smith of the USC Shoah Foundation. Further guidance in the relationship of art and genocide was given by Laura Pomerantz, Ph.D.
Additional support for this exhibition was provided by Visions and Voices: The USC Arts and Humanities Initiative.